Big news is brewing in the land of Trouble the black cat detective. 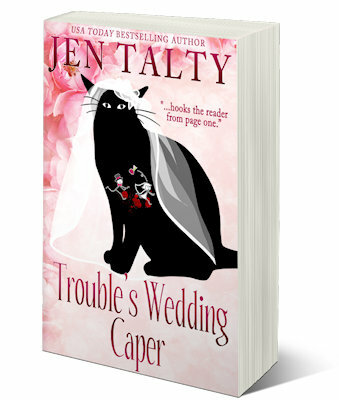 Jen Talty’s TROUBLE’S WEDDING CAPER will be released February 4—and if you’ve ever wanted to plunder through a storage unit of vintage wedding stuff, this is the book for you. Except it’s not all bridal veils and lace. There’s something deadly going on. Pre-order here! 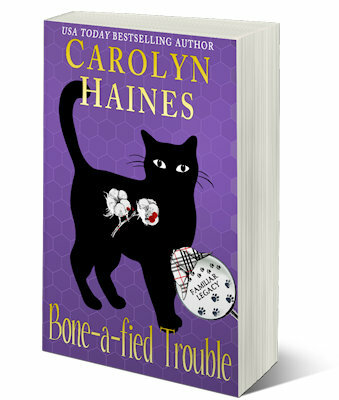 My book, BONE-A-FIDE TROUBLE, which blends the worlds of Trouble and Sarah Booth Delaney in an agri-thriller, will release March 5. You can preorder here! And if you’re new to the world of Trouble and want a sampling of the books—we have two on sale for only .99 cents each. 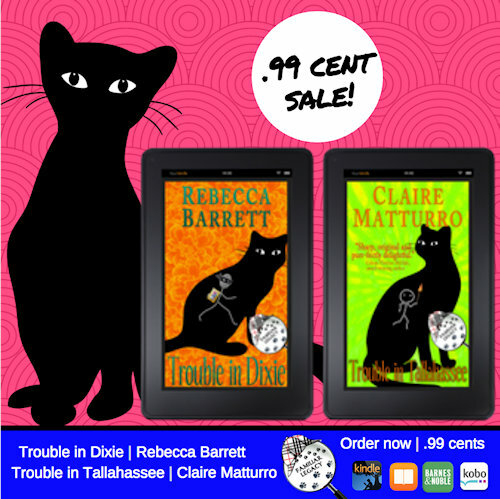 TROUBLE IN DIXIE by Rebecca Barrett and TROUBLE IN TALLAHASSEE by Claire Matturro. The Trouble books are written by different authors in a multi-author collective we’ve named the #madcatters. We share the character of Trouble, who has a “voice” in the book (really it is only his thoughts, and they are pretty scathing where bipeds are concerned). Trouble has studied under his father, the famous Familiar, black cat detective. And he’s watched way too many episodes of Sherlock Holmes as played by Benedict Cumberbatch. Even though he is a Wetumpka, Alabama cat, he “thinks” with a slight British accent. Here’s the opening of BONE-A-FIDE. I smell money! I’ve heard the expression all my life and thought it was an exaggeration of the rapacious American spirit of Manifest Destiny. Not true! I, quite literally, smell it. It’s the odor of this rich Delta soil being turned over by the big machines plowing and planting. Another money crop is going into the Mississippi alluvial ground, and yes, now I understand what money smells like. Something to keep in mind as I learn my way around Sunflower County in Mississippi. I’m here on a mission. A fellow feline, Pluto Delaney, has called me in to assist him in resolving a mystery. Pluto needs to find a missing female humanoid. 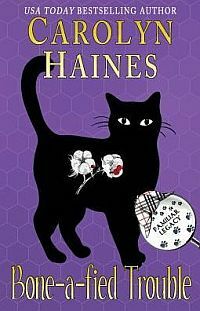 Trudy Wells belongs to one sassy little marmalade kitty named Vesta, and Vesta is missing her human. Pluto has a thing for Vesta, and I’m here to help. Nothing flips my ascot as much as a mystery given to me by a black cat almost as eloquent and articulate as I—a mystery that also involves a missing person. If anyone can find the missing girl, I’m that bloke. Pluto, who lives on a fine plantation in the Mississippi Delta, has issues of transportation. He’s not savvy about hitching rides and public transit, which is in short supply in the land of King Cotton anyway. When he heard I was in town with my biped, Tammy Lynn, he sent out an S.O.S. I responded, of course, and hence I’m currently sussing out the circumstances at the elegant Long Hall, home of Samuel and Charline Long. They’re elders of the agricultural Long family—the place where Trudy Wells worked before she vanished off the face of the earth. While it’s possible Trudy has simply moved on, Pluto suspects foul play. Peeking out of the Long shrubbery, I’m getting an eyeful of a long-stemmed American beauty with a fiery mane. The redhead in question has been snooping around Zinnia, Mississippi, the county seat of Sunflower County. She goes by Tabitha Kingsley and the locals say she has a pact with the devil. She’s a psychic medium—or so she says—and can communicate with the dead. So what is she doing here at Long Hall? I watch her exit a new Genesis G90 black sedan. She has all the physical attributes I normally find endearing, yet I have reason to be wary. Tabitha Kingsley has the look of a woman of money and privilege. It’s in the way her long red curls swing when she walks, the perfect drape of her dress, the long, tapered legs and expensive heels—and I am a cat who knows my stilettos. Looks aside, she’s likely a con artist. I have a healthy skepticism for such professions. My interest in Tabitha Kingsley concerns the nosey questions she’s been asking about Trudy Wells. My mission—and I have accepted it—is to find out what she is after. My immediate need is to make Tabitha think that I’m part of the Long family. I rush up to her, crying to be let into the house. Oh, my, her gaze is intensely green. She has very feline eyes that seem to pierce my soul! I hope she’s not smarter than the average humanoid because she might see through my scheme to get into the house and eavesdrop on her conversation. She is knocking on the door just as I planned. Long Hall is definitely a posh place—statuary along the drive, what looks like a topiary of…dear god, it’s schnauzers. All poses of those high-energy, bouncing, and annoying dogs. When human taste goes wrong, it’s deplorable! This is a perfect example of the old saying that big money doesn’t mean good sense or taste. The topiary would be far more attractive if it were cats. Lucky for me, Tabitha is too twitchy to pay much attention to me. She’s shifting her slender weight from hip to hip, picking at her nails, settling her perfect dress, all the classic signs of impatience or nervousness. Could be both. I mean how is she faking those psychic readings she’s conducting. But I, Sherlockian trained detective that I am, shall investigate. Trouble, the black cat detective, is far more adept at finding the diabolical machinations of the human heart than any mere biped. Ah, the door is opening. I slide inside before anyone notices. There is a pleasant exchange of greetings and I have to say, I find Tabitha’s voice to be polished and pleasing with a dollop of sincere kindness. If she’s a fake, she’s very good at the scam. Charline Long is seeking counsel from Tabitha. I must determine how Tabitha fits in with the missing Trudy Wells! The conversation is heating up. Not to fear, all will be well. Trouble is on the case. The books contain a serious mystery, and also a little bit of romance. Trouble is a master at finding the bad guys and pushing the humanoids in the right direction toward love. There are seven novels in the collection so far, and aside from Jen’s and mine, we’ll publish three more titles this year so get ready for a full year of Trouble. If you give the books a try, I do believe you’ll be hooked on the sassy black cat who is smarter than your average human! And he loves to tell you all about it. 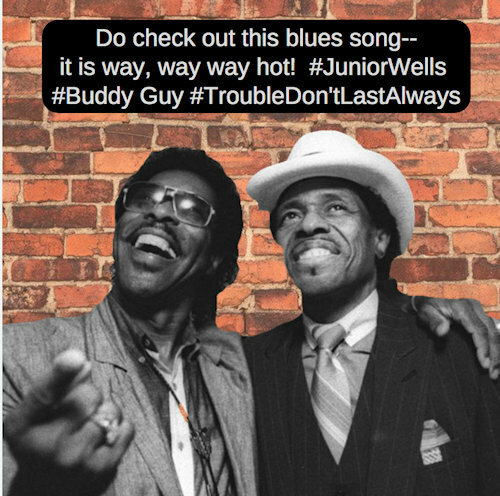 And while you may want Trouble to last forever—Junior Wells and Buddy Guy have a great blues song for you—click on this “Trouble Don’t Last Always.” Man, this is the sound of the Mississippi Delta. The critters and I hope you enjoy it! If this doesn’t make you want to stomp and holler, check your pulse. I think you’re dead! P.S. Another giveaway in my monthly contest!